Transactional HTTP TestCase with url_open and Chrome headless helpers. A decorator to tag TestCase objects Tags are stored in a set that can be accessed from a ‘test_tags’ attribute A tag prefixed by ‘-‘ will remove the tag e.g. to remove the ‘standard’ tag By default, all Test classes from odoo.tests.common have a test_tags attribute that defaults to ‘standard’ and also the module technical name When using class inheritance, the tags are NOT inherited. Saving the form returns the created record if in creation mode. Finally One2many are reified as O2MProxy. recordp (odoo.models.Model) – empty or singleton recordset. An empty recordset will put the view in “creation” mode and trigger calls to default_get and on-load onchanges, a singleton will put it in “edit” mode and only load the view’s data. view (int | str | odoo.model.Model) – the id, xmlid or actual view object to use for onchanges and view constraints. If none is provided, simply loads the default view for the model. Behaves as a Sequence of recordsets, can be indexed or sliced to get actual underlying recordsets. Adds record to the field, the record must already exist. The addition will only be finalized when the parent record is saved. Removes a record at a certain index or with a provided id from the field. Returns a Form to edit the pre-existing One2many record. The form is created from the list view if editable, or the field’s form view otherwise. Returns a Form for a new One2many record, properly initialised. Removes the record at index from the parent form. In Odoo, Python tests can be tagged to facilitate the test selection when running tests. Subclasses of odoo.tests.common.BaseCase (usually through TransactionCase, SavepointCase or HttpCase) are automatically tagged with standard, at_install and their source module’s name by default. --test-tags can be used to select/filter tests to run on the command-line. This option defaults to +standard meaning tests tagged standard (explicitly or implicitly) will be run by default when starting Odoo with --test-enable. 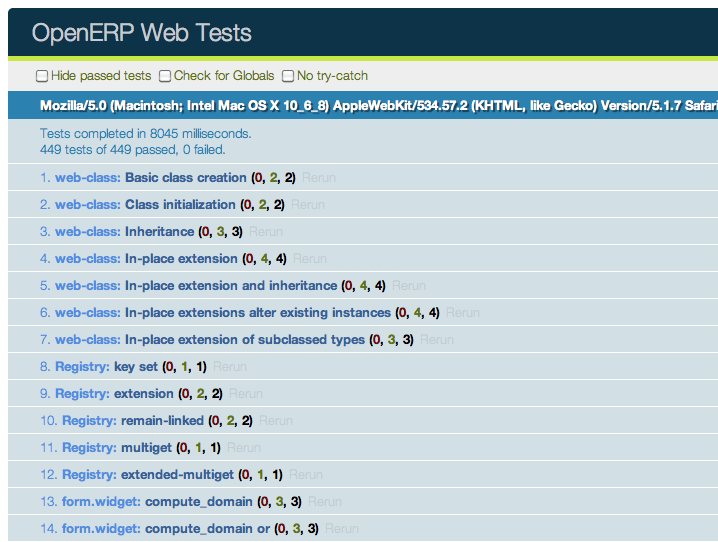 When writing tests, the tagged() decorator can be used on test classes to add or remove tags. The decorator’s arguments are tag names, as strings. standard: All Odoo tests that inherit from BaseCase are implicitely tagged standard. --test-tags also defaults to standard. That means untagged test will be executed by default when tests are enabled. at_install: Means that the test will be executed right after the module installation and before other modules are installed. This is a default implicit tag. post_install: Means that the test will be executed after all the modules are installed. This is what you want for HttpCase tests most of the time. Note that this is not exclusive with at_install, however since you will generally not want both post_install is usually paired with -at_install when tagging a test class. Tests will be executed only in the installed or updated modules. So modules have to be selected with the -u or -i switches. For simplicity, those switches are not specified in the examples below. Testing Python code and JS code separately is very useful, but it does not prove that the web client and the server work together. In order to do that, we can write another kind of test: tours. A tour is a mini scenario of some interesting business flow. It explains a sequence of steps that should be followed. The test runner will then create a phantom_js browser, point it to the proper url and simulate the click and inputs, according to the scenario.